The second day of our press trip was devoted to the Appellation communale Minervois La Livinière, also one of the exclusive high-end AOCs of Languedoc, which they call the 1er Cru du Languedoc. The area is located north-west of Narbonne on a Causse bulging from the southern foothills of the Massif Central from which cooler winds make the climate milder than in the Languedoc plains. The area is just gorgeously beautiful with patches of vineyards on remote valleys, old villages, winding roads with little traffic and dry stone walls made without mortar that seem to have been standing there for centuries. This is the part of Languedoc where you hope they didn't have parcels uprooted to get the EU subsidies (it alas happens). The AOC La Livinière which gathers 6 villages (Azillanet, Azille, Cesseras, Félines Minervois, La Livinière & Siran) is officially born in 1999, taking the name of the village of La Livinière (pictured on left), it was the 1st of its kind in the Languedoc (that's why the first Cru I guess) and the result of many years (let's say 30 years to this day) of common work, 2 persons having done much of the work to lead the other growers : Maurice Piccinini (who was the president of the Coopérative then) and Roger Piquet. The planted surface today is 350 hectares and the total surface of the area (with some potential for more vineyards) is 2700 hectares. 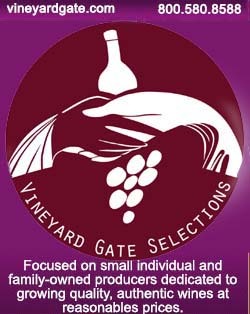 30 or 40 years ago this area was basically dedicated to making ordinary table wine and given the potential and qualities they chose the right direction in bringing the other producers toward a higher quality production. There are more than 40 vignerons involved in the production of AOC Minervois La Livinière, they are mostly small-size farms and the good point is that the number is going up, meaning new domaines are popping up, some of the new domaines come from the outside, like the multi-domaine group Gerard Bertrand who settled here 20 years ago by buying back a domaine. Total yearly production is about 11 500 to 12 000 hectoliters, with a slow but steady increase year after year. The vineyards that are scattered all around in small valleys, on the slopes or along villages can be as high as 350 to 400 meters with the Meditteranean 60 kilometers away. the area is backed to the Montagne Noire (black mountain), a big if little known mountain range which blows coooler winds in summer that have a positice influence on the maturity of the grapes. The parcels are often planted on terraces the old way with lots of stones on the surface as well as round pebbles. The Causse is made with limestone (of the chalky as well as the grey type) alternating with clay & marl but there's also schists (you can guess them on the strats on the right). We also had a tour with 2 4WD around on the side roads to have a visual experience of the topography and I was impressed by the remoteness and even isolation of many of the parcels, we're far away from the image of endless plains covered with irrigated vineyards. And the area is authentic Provence landscape and plants, we stopped a couple times and we spotted thyme, rosmarin, everlasting and even wild lavender (I shamelessly took away some thyme to bring back to Paris). The Appellation focused mainly on the three following varieties Syrah, Grenach & Mourvèdre, the Syrah finding here favorable terroirs for its expression. Mourvèdre is here certainly on its western-most latitude for its maturity but it's often in areas on the edge that a given variety yields beautiful results. Grenache feels comfortable in all situations, rustic nough to handle water stress on the driest terroirs. As accessory varieties they also have Carignan, often old vines on these terraces that give good results when you know how to wait. They have Cinsault too, plus a few local varieties that can be blended too for a better tension. Several people guides us during this day and here again someone from the Coopérative is credited for being very active in the push to bring this appellation up with strict quality and farming requirements. The Coopératives in the Languedoc don't have often a good image but here it was pivotal for the start of this appellation communale, and the president of the Coop today, Guy Sabarthès, looks like he has a real faith in keeping improving the farming practices and general quality here. The Coop is named Vignerons de La Livinière and is part of Alliance Minervois, a regrouping of several Coops of the region. The coopérative of La Livinière counts as one among the 40 producers of the appellation and it makes a total volume of 1500 hectoliters, 1000 being organicly farmed. If you're into architecture stuff, the area has great things to see, like the vineyard shacks named capitelles in this region. The growers and workers would build them all the while working on their parcels, certainly using stones they took out while tilling or plowing their arid parcels. They're made like the walls bordering the terraces, with large flat stones and without any mortar to keep them together, that's amazing how they hace resisted a couple centuries, and there's a way to make the ceiling so that it holds by itself, great job and a very natural insulation against the heat. The sun can be punishingly hot here and vineyard workers basically walked to work here from their village, possibly sleeping in these shacks if necessary or at least hiding from the sun (or the rain) the time to eat a piece of bread and have some wine. Guy Sabarthès showed us the grape-varietal conservatory that was put in place here in the 1990s, it is located in the middle of nowhere in the hills along a gravel road, it holds about 50 varieties (several vines per variety), some being rare local varieties. they use the wood from these vines when they need to replant a parcel. They also isolated a variety (pic on left) which seems to be found nowhere else, they haven't given it a name yet and experts are doing research on it to know more about its origin (they have now a dozen of vines of it). They took the samples from 100-year old vines spotted in the region, they had 3 prospecting campaigns to find the interesting vines, scouting systematically these very old parcels in order to select the most interesting vines. Technicians checked that the chosen vines were healthy without hidden problem or disease, and they found a total of 48 grape varieties, some of them with odd names like Terret Blanc, Grand Noir de La Calmette, Verjus, Trepat, Bobal, Rivairenc Noir, Brun Fourca, Jacquez, . Then they looked out for a virgin piece of land where they would plant these selected samples for a genetic conservatory, they found this land surrounded by bushes and woods and planted the vines in 2007 & 2008.
the parcel is farmed by some of the coop growers and there's an interesting story : during one of the past years the appointed grower forgot to to a preventive spraying against oidium and all the vines got affected by oidium except the mysterious unknown variety... This variety has no fixed name yet but the temporary name is Grapy (the owner of the old parcel was named Gradin and there was a pylone or pylon in the parcel). This unknown variety seems not to be very productive, which might be the reason why it was not multiplicated by the growers in the past. And on the tasting side it's pretty interesting, very aromatic with a Cabernet style, they're vinifying on a small scale to see what it yields all the while having geneticians digging for its filiation. At one point we passed timely on a narrow road along a terrace where a man was walking his mule to plow the parcel, this is Gerard Bertrand's Clos D'Ora, the flagship domaine of the multi-domaine group which is wholly farmed on biodynamie, as explained by Richard PLanas who was with us in the 4WD vehicules. The domaine makes 9 hectares and was spotted by Gerard Bertrand in 1997 who discovered with soil expert Jean-Claude Jaquinet that the potential for terroir wines was unique here. they subsequently invested massively here, building anew from the ruins of a former sheepfold on the top of the hill to receive guests and also for a state-of-the-art vinification/cellar facility. Nicolas has a long lineage of growers/vignerons bhind him, working in this area, they found documents recently tracing his ancestors around the year 1600. He feels lucky to have the chance to work in their steps and in these conditions, doing the vineyard work year around. Richard Planas added something about the replacement of missing vines here, after trials in this particular parcel they decided to first plant the rootstock, leaving them grow a few years before grafting it with the chosen variety when they will be strong enough, it is understood that grafting works better on mature rootstock. __ Clos Centeille Minervois la Livinière 2011. Nice balance and drinkability, ample and juicy with a nice Umami mouthfeel. Very harmonious. 14 % alc. Mourvèdre, Grenache Noir & Syrah. The Mourvèdre is trained on lyre trellising in this domaine. Hand picking. Total destemming, open fermenters with numerous pigeages (stomping) during the fermentation, 4-week maceration, press juice added to free run. Sells for 19 €. __ Domaine de l'Oustal Blanc, Prima Donna, Minervois La Livinière 2014. Refined, elegant, with a nice quality of extraction (nothong rough or excessive), silky tannins with freshness all around, you'd think it makes 14 % but not its 15 %. Very nice wine if indeed powerful. Ugly triangular label but never mind. 40 % Syra, 60 % Grenache, yields 25 hectoliters/hectare; Grenache goes through a 18-month élevage in demi-muids (large capacity barrels), Syrah same time in 3-wine-old barrels. 6 more months in blending vat before bottling. Sells for 26 € retail. __ Champs du Lièvre (means Fields of the Hare in French) Minervois la Livinière 2015. Interesting bitterness in the mouth, quite a lot of extraction though. 2nd mouth & swallowed : Superb thin tannins, elegant wine with good drinkability in spite of its 15 % alc. 60 % Syrah and 40 % Grenache Noir, vines aged around 20 average, no use of herbicide on the parcels, yields 35-45 hectoliters/hectare, hand picking on selections to get the right maturity, separate vinifications with temperature control, 21-day maceration, pigeage and racking by hand, 18-month élevage in new oak. Owner Nicolle Meyer. Sells for 19 € retail. Here are the wines we tasted that day, on the left the individual selections (3 by 3) by the jury of journalists, center the sommeliers and right the vignerons. On the whole I'd say that whoever these journalists were their selection was the closest to what I liked, then comes the vignerons', but I didn't like very much the sommeliers' choice. The Chateau Maris Dynamic 2014 was rather good also with a refined tannic texture, although too much extracted I think; it's an organic domaine (Ecocert). You may ask if there are whites in this country, yes there are but not in this appellation area, or like this one they're labelled as Vin de France. During lunch this white was welcome, we had several "apéritifs" now and then on the two days and doing it with strong reds isn't properly adequate under the sun of Languedoc at this season and we weren't really sipping and refilling, we actually waited for the main dishes to come. You can pretty much pick a La Livinière with your eyes closed and have a great wine. They are all really delicious. We very much appreciate the wines of Domaine Gourgauzaud, Château Massamier la Mignarde (one of its wines was voted best in the world by a U.K. magazine) and Domaine Borie de Maurel near Félines. I'm doing a bit of research on Minervois and found your article interesting and helpful. The grapevine conservatory is particularly interesting- do you know if they officially named the newly found grape? Would love to visit the area and taste several indigenous (?) varieties, as well as wineries. Thanks for a great post!